Back muscle exercise. Lat exercises. Back exercise workout movements. Step 1. For a better grip, use wrist wraps. Grab the bar with an overhand grip, head up, cross or bend the legs, and pull all the way up until the bar meets the chin. Step 2. Fully engage the lat muscles by arching your back. Keep your elbows lined up with your shoulders. Step 3. Lower your body slowly, feeling a complete stretch in the lats. 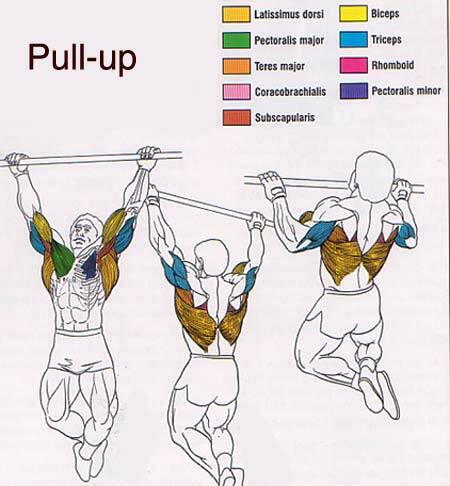 Pull-ups are the best back muscle exercise. Step 1. Bend over, using a bench to help balance your body. Step 2. Keep your head up, and your palms facing your ribcage. Step 3. Proceed to lift the dumbbell all the way up until the weight reaches the lower part of the chest. Keep your elbow positioned behind the dumbbell, for best results. Step 4. Lower the weight, all the way back down, feeling the lat muscles fully stretch. Make sure you focus and totally concentrate on the lats during the entire movement. Think of your hands as hooks, so that the lat muscles are responsible for the movement going up and back down again. Step 1. Hold the barbell bending over. Fully extend the arms. Step 2. With an overhand grip, pull the weight up, until the bar reaches the lower abdominal area, preferably just above the belly button. Keep the elbows close to your sides. Step 3. 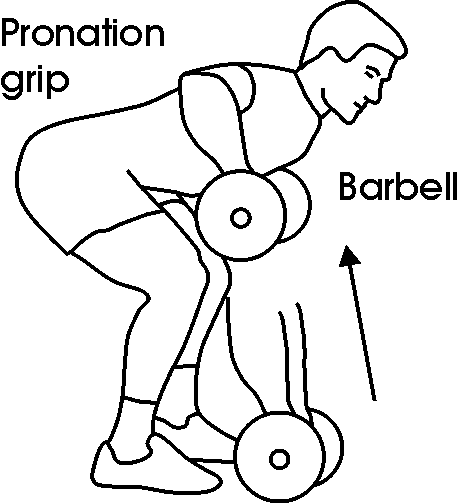 Lower the weight, until arms are fully extended back in to starting position. If you have a V-bar just slide it underneath the barbell and use it to pull the bar up. Or, just use the barbell by itself. Which ever feels the most comfortable. Step 1. 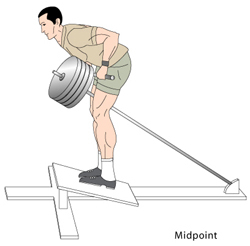 This is just like the bent over barbell row, but this time we're going to be pulling up on only one end of the bar. You'll be pretty much doing the same thing as you did with the bent over barbell rows, but this time your hands will be in a slightly different position, giving you a slightly different feel. From: Back Muscle Exercise. Back To: Weight Lifting Exercises.